Welcome to another Freshly Brewed Projects with the Latte Girls. This week we are highlighting the Petal Passion Suite. This suite is so gorgeous. I am biased though, because anything floral floats my boat. The black and white tones of the patterned paper and the numerous images in the stamp set, make it a very versatile suite. Add to that the two gorgeous embossing folders and the oh so cute metal embellishments. Plus then there is the Memories & More pack of cards. This suite has so many possibilities. But don't take my word for it, see it all below. 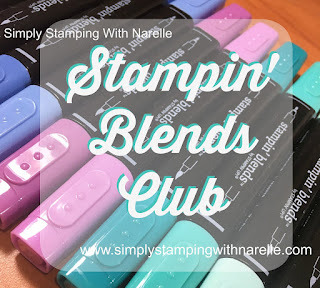 Do you want to learn more about our new alcohol markers, Stampin' Blends? Then I have what you need. Did you know that my team get all my classes for FREE. Yep that's right. All the tutorials and videos I make exclusively for my classes and clubs, are available for all my team members free of charge. So if you want an endless supply of inspiration whilst purchasing your products at a discount, then why not join my team today. This is such a striking card Narelle ... the colours work together so well. what a striking colour combination! Love it!